This isn’t a walk so much as a wallow in flowers at an Open Garden event last weekend. I did propose a walk to nearby Witton Castle, but ‘someone’ was feeling lazy, so we opted to loiter instead. 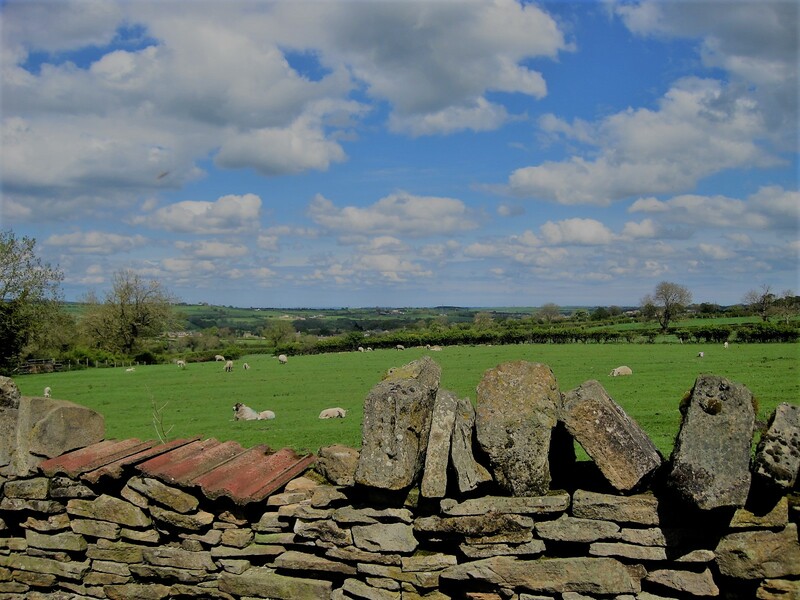 Hillside Cottages are in the quintessentially English village of Low Etherley, a few miles from Bishop Auckland, in County Durham. A look over the garden wall will show you the lie of the land. Calm and pastoral. I love nosing around a garden. My plant knowledge isn’t huge, but I do enjoy identifying a friend or two. Small explosions of colour lure me into the borders. Rich plum, ‘poke you in the eye’ orange and soft pink mingle with the green. There are two gardens, side by side, quite different yet so harmonious that the division between them is little more than a gap in the adjoining hedge, which I initially fail to spot. The first swathes gently down the hillside, beds and borders speckled with colour. 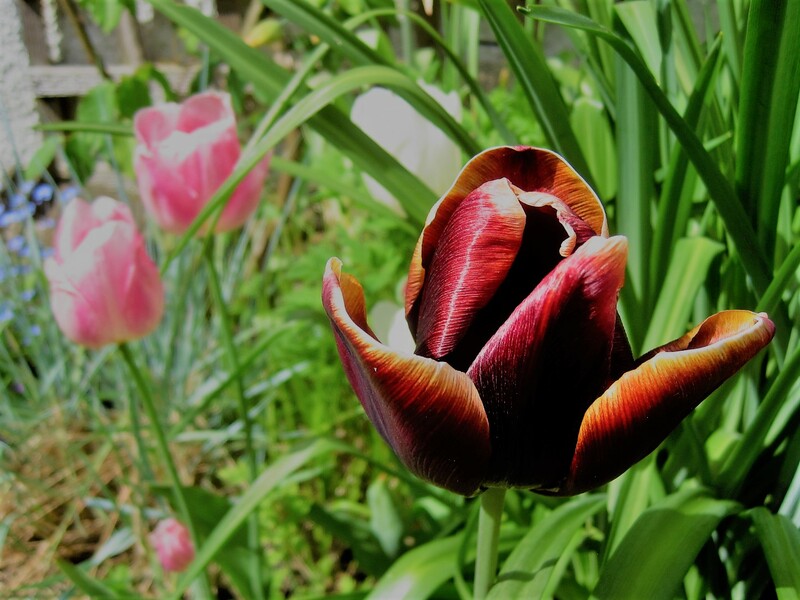 The lady owner is obviously a lover of tulips, with all their nuances, subtle or flaunted. Poker straight or curling seductively. I can hear the sound of pipes, and rounding a corner I come upon the culprits. 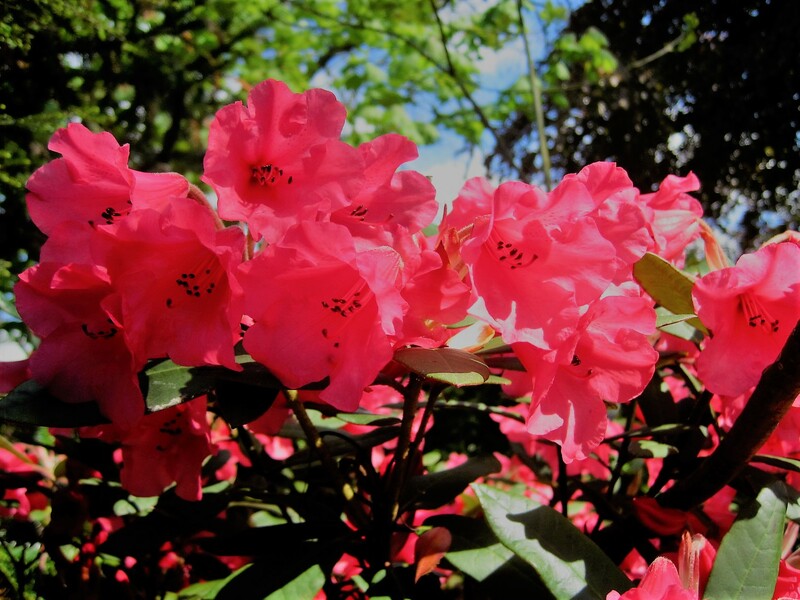 I don’t pay them the attention that I should, because I am beguiled by the rhododendrons. In the most glorious colours, the sun sparkles through them, bathing me in radiance. This is the very best time of year, and life burgeons all around me. I almost miss the delicate lemon magnolia, opening to the sun’s caress, high above my head. Tea is brewing, alongside an array of homemade cakes, but first we must round the pond and slip through the fence to next door. A sense of humour prevails in next door’s garden, where another pond winks at me in the sunlight. This garden feels much more enclosed, and you wander beneath tall pines, seeking out quirks and fantasies. By a summerhouse the owner lounges benevolently in a deck chair, chatting to some older ladies. Probably they supervised the baking. 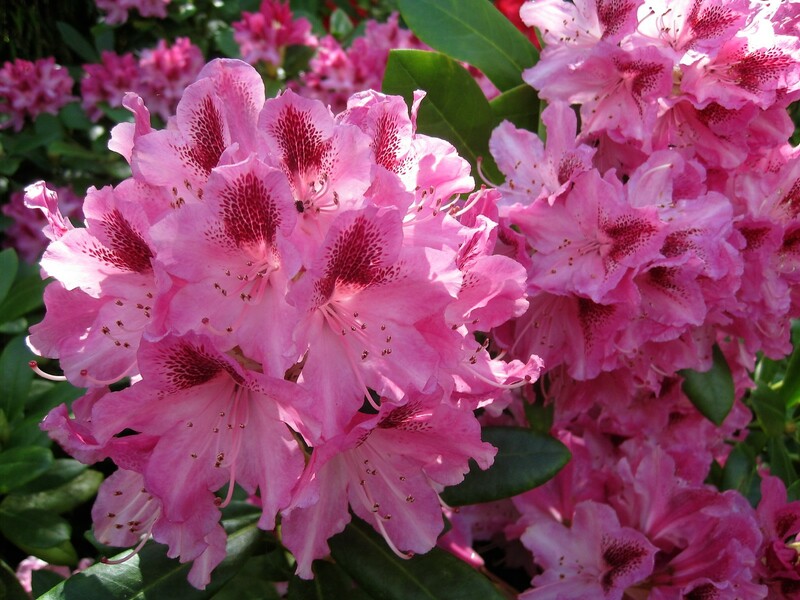 Scintillating rhododendrons, of course! I’ve never been able to resist them. I hope you didn’t mind me taking it easy this week. This is the time of year when traditionally I share a few gardens with you. I have a much more energetic one lined up for next week. Wait a moment, I can hear you saying… what happened to the cake? I can assure you that my rhubarb cake was moist and delicious, but there were no seats left, so I had to eat it perched upon a wall. Not conditions that are compatible with cake photography. Sorry! Join me next time on Jo’s Monday walk? It will be a Bank Holiday in the UK, but I’ll still be out and about. After that I’ll be taking a break for my visit to Poland. Many thanks to you all for your walks and for your great company. Jackie never needs any encouragement to eat and drink. Join her for a cuppa? And Drake, often one to surprise, takes us to a tobacco museum! Yet another lovely morning here! I’m starting to take it for granted. Let’s see if it holds for the Bank Holiday. Meantime, have fun, and take care. See you next week! Beautiful colors and photos as always, Jo. Nice gardens to stroll, sit and reflect. 🙂 Thank you for posting my link as well!!! I”m way behind on blog reading, as I’m back on the road full-time and internet (and data) are not so easy to get in some areas of this country. No worries, Liesbet. It’s not easy to keep up at the best of times. 🙂 🙂 Monday’s walk will be my last for a while so you’ll not need to look for me. Thanks! It may have been a shorter walk, but it was lovely! The flowers are magnificent and so are the photos of them. Don’t you love the burst of color and life in spring! I have an unexpected walk we found on the way home last week Jo. Hope you enjoy it. Thanks, darlin 🙂 🙂 Be with you in a tick. Isn’t he lovable? 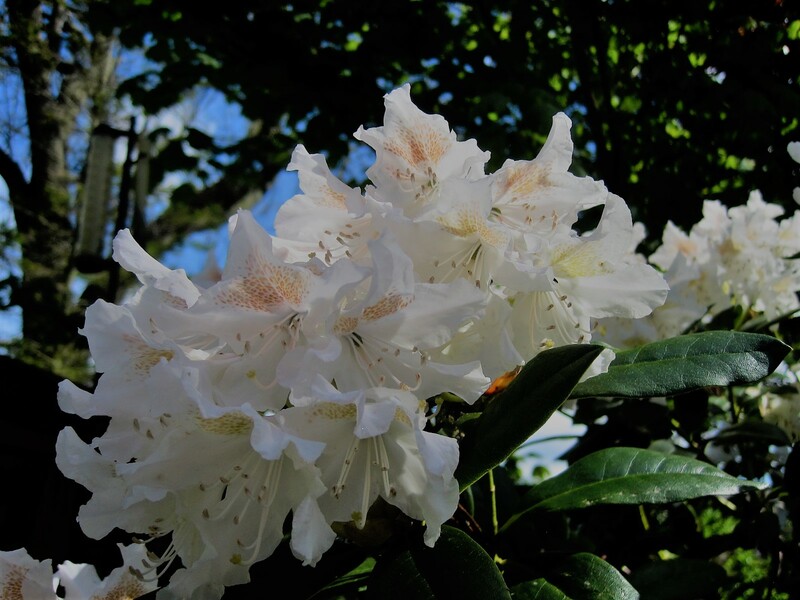 🙂 🙂 I was at Cragside on Thursday, Drake, and I was bowled over by the rhodies and azaleas. I shall be boring everyone for weeks to come. Why doesn’t my garden look like this?!! Oh wow!!!! Those Rhododendrons are amazing. This has brought back many happy memories as working as a gardener for the National Trust!!! It truly is a fantastic time of year!!! I was blessed to work on St Michaels Mount for 4 years while I was doing my ND horticulture. I was at Trengwainton Garden for 2 years aswell. I also did a brief spell at Godolphn and Eat Pool Mine. I know the whole of the West Cornwall portfolio very well indeed! Such plant diversity in a beautiful spot of the country. If you get the chance do visit if just for the coastal path and gardens!!! Wallowing in all the gorgeousness along with you Jo 🙂 When do you leave for Poland? Each photo is a world apart…. Magnificent captures of magnificent flowers! Bless you, darlin! 🙂 🙂 So nice to hear from you, Anna. Hope things are progressing smoothly? Incredible photographs and gardens. This is my first time here and as soon as I finish my comment I will click on the ‘follow’ button.